A wonderful decoration for your haunted room or garage door display. 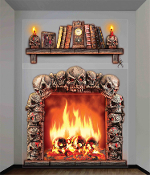 Realistic roaring skull fireplace with burning skulls in flames with bookshelf with skull candle holders, books and spider pictured. This will set the mood for sure. Printed on a transparent plastic background with opaque inks for a great 3D illusion. Includes 2 huge life size wall decorations for your own haunted house decor: Fake Fireplace and spooky bookshelf with blood dripping candles in skull candle holders. To Apply: Cut out decoration with scissors and attach to a flat surface with your choice of adhesive materials. (Adhesive NOT included) Complete the landscape with other create-a-scene setter backdrops, borders and other creepy decorations and accessories.